N 5756 County J, Gleason WI. 54435. About a mile and a half from Underdown Horse Park, in north central Wisconsin. We have used an innovative idea from Cinch Chix and AGI, both made in the USA. 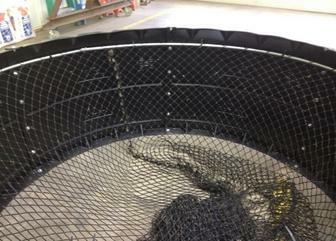 We assembled their feeders to make a 6' diameter ring which is what you would need for a 4 x 5 bale or a 5 x 5 bale. We then bent 2 pieces of 10" conduit to fit the inside diameter of the ring. Once the netting was threaded onto the conduit, we used 2 conduit connectors to complete the circle. We then drilled holes in the feeder and used zip ties to fasten the ring to the bottom side of the feeder. All you need to do then is set the round bale on the ground and flip the feeder over the bale. The conduit side of the feeder is closest to the ground. When there is about what is equivalent to 1 small square bale left we just flip the feeder over and let the horses clean it up. Once they have cleaned that up, we would then place another bale out. These feeders are light weight and we haven't had any problems with them freezing to the ground.